At the risk of further enraging those readers who hate off-topic posts, here's a photo (does it count as on-topic for architectural photography?) of the fantastic new Netherlands Institute for Sound and Vision building in Hilversum, by architects Willem Jan Neutelings and Michiel Riedijk. The brightly colored facade, which the Times says "draw[s] on everything from primitive temples to comic-book illustration and the decorative ephemera of Andy Warhol," are made of cast glass. The building is conceived as a cube that is half underground and half above. Watch the building go up in photographs. That place is simply incredible. Bold & Beautiful. I like your OTA's! Keep them coming! Your tangents are almost always interesting. It's good to have a diversion once in a while. All photography and no play makes Jack a dull boy. For me it's a one hour drive from my hometown, so I will soon be visiting the museum. 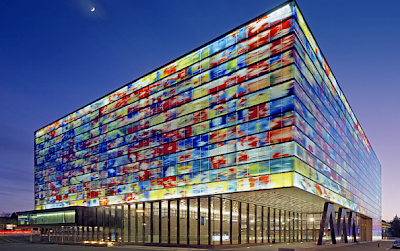 Not only the building, but also the exposition about Dutch television is worth a visit. I can appreciate that as both a photographer and a Chartered Quantity Surveyor. Who hates off topic posts? That's ridiculous. Count this as another vote for you to post whatever you want. I come here for your writing style and humour as well as the varied and valuable photography content. To keep this comment on topic: that building is stunningly beautiful. Hilversum is well known is Europe as one of the exotic sounding places on the dial of an old valve radio. Fun if you still have a single digit age or a single digit IQ combined with a celebrity fetish, but for learning about broadcast history and technology, it leaves a lot to be desired. The former Omroep Museum ("Broadcast Museum") was a much more educational place, staffed by volunteers with actual broadcast experience that would explain things in as much detail as you liked. "Hilversum is well known is Europe as one of the exotic sounding places on the dial of an old valve radio." Mike, old valve equipped radio's did not only show a scale in KHz and wavelength in meters, but also the station names like 'BBC1' or 'Hilversum2'. This was possible because the radio frequencies and names were fixed. With this blog I really do learn something new every day! "Valve" is British English for vacuum tube. So a valve radio is nothing more than a tube radio. And Hilversum was, with Radio Luxembourg, one of the first places to start broadcasting rock'n'roll in Europe. You can hear about it in Van Morrison's In the Days before Rock 'n' Roll. Nice song, BTW. This seems "photo-related' to me. I don't think it's the OTA's per se that give some of us heartburn. Delving into music, architecture, or aspects of other art forms can dovetail nicely with the main focus of your blog - photography. It's the occasional political rants that we can live without. Yours is the only site I visit regularly (okay, well ebay) and I appreciate the off as well as on topic subjects. God knows, that if we didn't appreciate your OTAs, we would quickly tell you.